A Catholic priest arrested and charged with sexual abuse of children during his longtime residency in the Philippines lived with numerous underage boys, prosecutors say. The US and the Philippines announced the arrest of Rev. Kenneth Hendricks, 77, on charges of engaging in illicit sexual conduct in foreign places, a federal crime that could result in up to 30 years in prison. The Catholic priest had been residing in the Philippines for almost 40 years, receiving some funding for missionary work from the Archdiocese of Cincinnati. This case is sadly far from isolated in the majority Catholic Philippines. 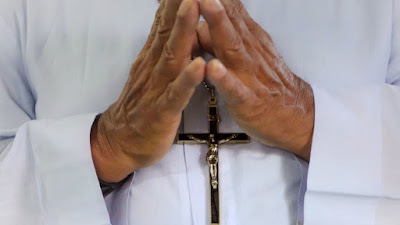 In 2002, the Catholic Bishops' Conference of the Philippines’ President Orlando Quevedo estimated that in the course of last 20 years, some 200 of the 7,000 priests in the country may have been involved in illicit sexual activity. Many disturbing details came to light during the investigation, such as the prosecutor’s claim that Hendricks had multiple children living at his residence: “It is alleged he insisted they take baths together and would molest the victims alone or with other boys. The age of those abused ranges between 7 and 12 years old. Some of them were abused multiple times over extended periods. All of those Hendricks assaulted met him through his official work in the church; many of them when they signed up to be altar boys. The investigation was initiated after some victims filed complaints with the police. Those that came forward had consistent elements which helped police verify the claims and find more victims. Prosecutors also have access to a recording of a conversation between Hendricks and one of his victims, in which he discusses reaching a settlement with his victims’ parents and resigning if found out. In one of the stomach churning recordings he is heard lamenting that “Happy days are gone” and that “It’s all over,” according to the criminal complaint. Mike Schafer, a representative of the Archdiocese of Cincinnati, said that they “know next to nothing about this man,” with the Diocese claiming on their website that Hendricks “is not, nor ever has been, a priest of the Archdiocese of Cincinnati” next to his listing as one of the church’s missionaries in Asia. This case is sadly far from isolated in the majority Catholic Philippines. In 2002, the Catholic Bishops’ Conference of the Philippines’ President Orlando Quevedo estimated that in the course of the last 20 years, around 200 of the 7,000 priests in the country may have been involved in illicit sexual activity.